It's cozy, overcast and chilly weather here. Good for making pots of Carrot Soup with mondo veggies the kids dug out of a farm garden and casting on some good knitting. Since we're also ramping up for the Winter Issue in just a few weeks and hosting two Knitting Retreats, it's not exactly sit-around-and-knit at KC central, but I'm really enjoying the cozy feeling, working on a couple of my own design projects and looking at this in the moments between. 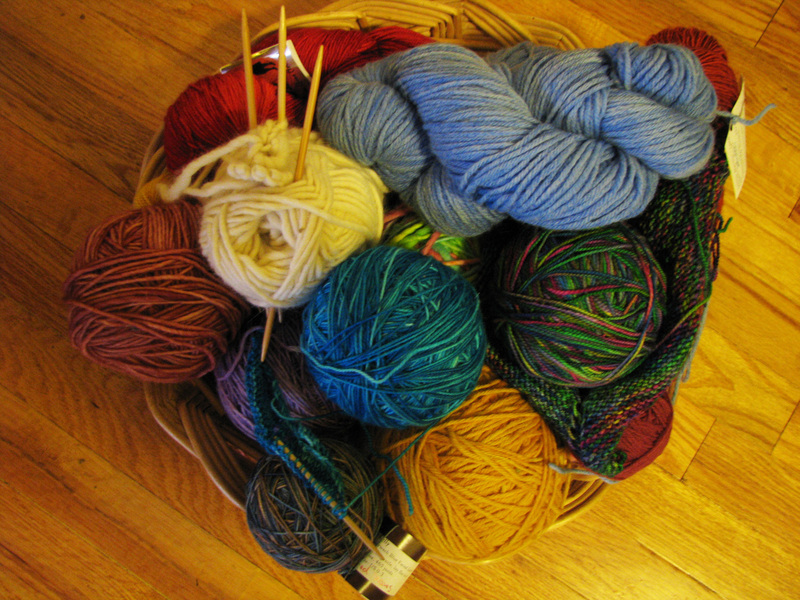 This basket of yarn sits on my office shelf, always within easy reach, and its colors and textures soothe and inspire me by turns. Whenever I see yarn from my stash, just waiting for me to cast on, I feel lucky. And happy.